On Aug. 4, 2018, Patrick Stewart announced his return to the role of Capt. Jean Luc Picard on a new CBS All Access series. As a famous "Star Trek" captain once said, things are only impossible until they're not. An incredible 24 years after "The Next Generation" (TNG) finished its television run, star Patrick Stewart announced he will reprise his role as Captain Jean-Luc Picard in a new CBS series. TNG was a groundbreaking series in its day, dealing with sensitive matters such as torture and gender equality as it followed a space crew exploring the universe and occasionally fighting other species, such as the Borg and the Romulans. TNG clocked seven seasons and 178 episodes between 1987 and 1994, also generating four Hollywood films after the series' end. Kurtzman appeared unexpectedly at the "Star Trek" Convention Las Vegas this past weekend, along with Stewart, to confirm the rumors were true, according to ComicBook.com. No details were released about when the series will debut or how many episodes it will run. "It is an unexpected but delightful surprise to find myself excited and invigorated to be returning to Jean-Luc Picard and to explore new dimensions within him. Seeking out new life for him, when I thought that life was over," Stewart wrote in a statement posted ton Twitter Saturday (Aug. 4). 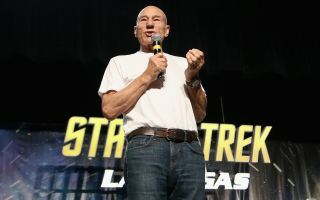 "During these past years, it has been humbling to hear stories about how 'The Next Generation' brought people comfort, saw them through difficult periods in their lives or how the example of Jean-Luc inspired so many to follow in his footsteps, pursuing science, exploration and leadership," Stewart continued. "I feel I'm ready to return to him for the same reason — to research and experience what comforting and reforming light he might shine on these often very dark times. I look forward to working with our brilliant creative team as we endeavor to bring a fresh, unexpected and pertinent story to life once more." Stewart's last appearance as Picard came in 2002, in the movie "Star Trek: Nemesis." Stewart began his acting career in the 1960s, winning a major award in 1979 for his stage performance in Shakespeare's "Antony and Cleopatra" in London's West End. Stewart is also known for a number of television and film roles, including Professor Charles Xavier in "X-Men" and CIA Deputy Director Avery Bullock in "American Dad!" The "Star Trek" franchise celebrated its 50th anniversary in 2016. Among its many followers are a number of NASA astronauts, including a handful who made cameos in the series over the years. Editor's Note: This article has been corrected to reflect that TNG ended its television run 24 years ago, not 28.